In the mid ’90s I was living on the outskirts of Worcester, UK. While out for a stroll I came across some farm buildings that were being converted into a restaurant. Being England, a pleasant sunny afternoon quickly turned dark as rain clouds rolled in from the Malvern Hills. I decided to head home; on turning the corner of the farm I noticed a number of framed portraits on the side of the road leaning against the side of a red brick barn. The pictures were in various states of decay suffering from water damage and mildew. By now large rain drops began falling, so I hastily grabbed one the photographs and headed home. I was able to lightly clean the picture and restore the frame. My female ancestors have a curious assortment of first names from Doris through Hilda to Emmelina. 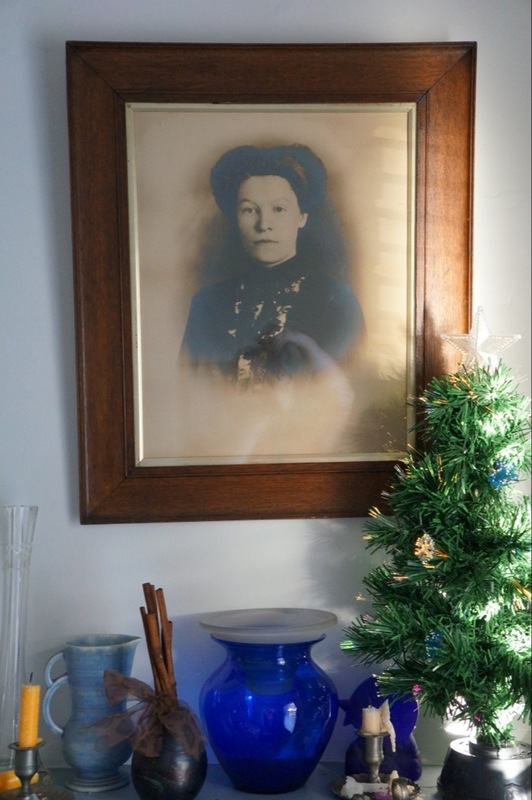 As far as I was aware none were named Maud, so as the the unknown woman in the picture looked like someone I wouldn’t mind having as an ancestor she became my adopted Aunt Maud. Years later while researching relatives in my family tree I found I had a great grand mother called Matilda. Maud is a medieval form of Matilda, spooky………..
Aunt Maud hangs above a stone mantle piece in the kitchen. The fireplace would have housed the range when the house was built around the turn of the 20th century. A fitting place for my great grandmother’s namesake to watch over us. Beautiful frame and hairdo. I like how you bring her into your family and give her a little Christmas tree. It always breaks my heart to see old photographs for sale — or worse, being destroyed! — because I always think, “that was someone’s son … someone’s daughter … someone’s mother or father ….”. So glad you adopted Aunt Maud! I agree, thank you for taking the time to comment.